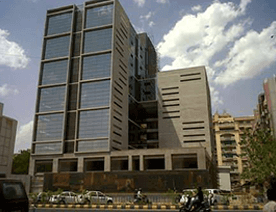 This story lies information for those beauty tech startups and entrepreneurs, who want to develop apps under the category of ‘beauty and fashion’. Let’s check out the figures and stats, which are overtaking the beauty sector. Gone are those days when people were buying cosmetics at a departmental store makeup counter. This is because of the on-demand beauty app startups named Glossier and Styleseat, who have created a buzz in the beauty sector. In the recent years, “beauty startups” have helped shape one of the fastest-growing areas in technology, with innovative unique brands raising around. Thanks to hyper-growth and investors. According to the report from Crunchbase, “Beauty tech startups enjoy boom courtesy of millennials”. Tech is the future of beauty industry. Let’s check out some pivotal points that will reflect the positive change in the beauty tech market. 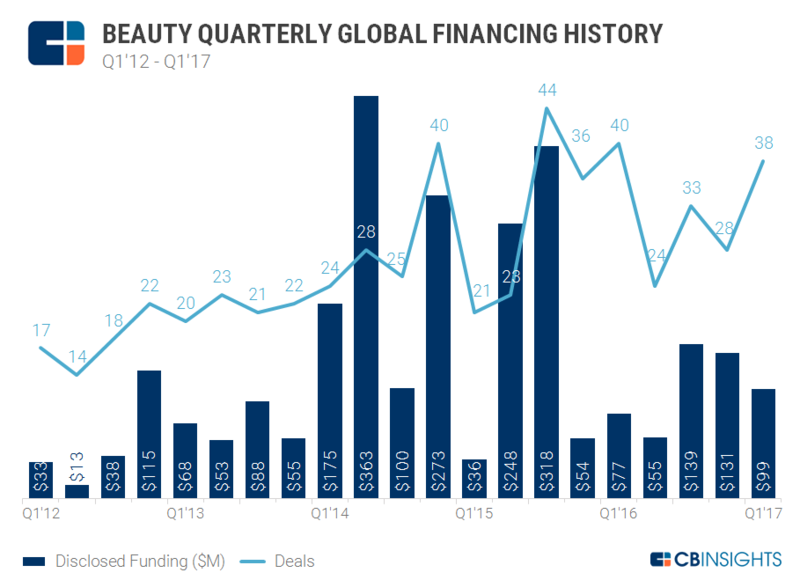 From the last few years, it has seen an upswing in financing for beauty startups, with funding rounds steadily increasing since 2012. 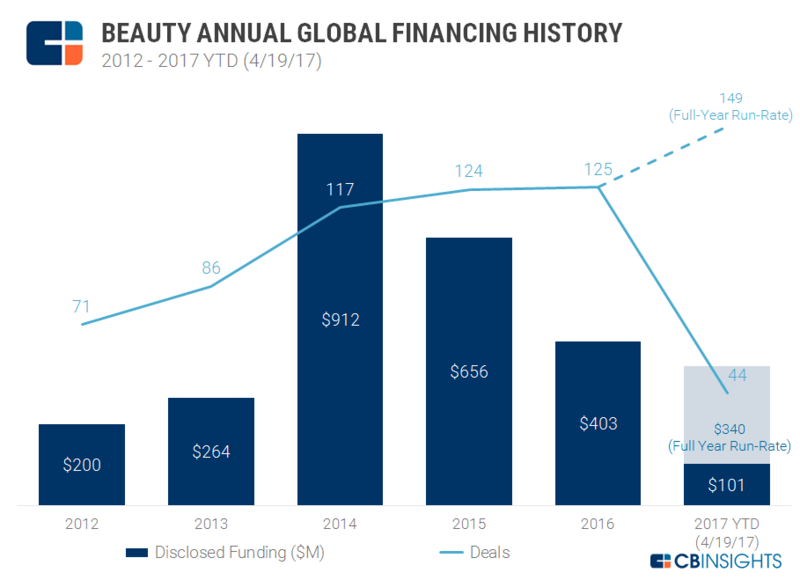 In 2016, various new beauty companies had already snagged more than 74 rounds of funding, according to the report from CB Insights. 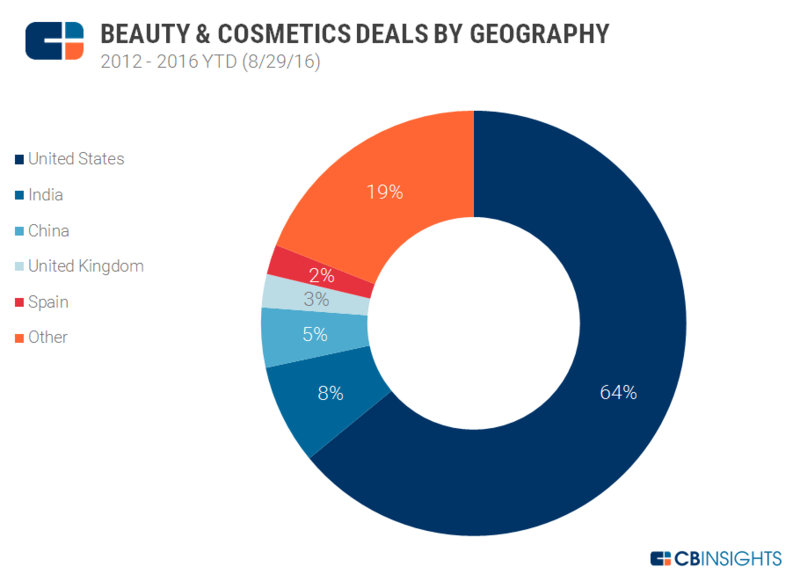 Beauty startups attracted over 70 funding rounds worth nearly $300 million in 2016. Beauty and Cosmetic deals by Geography: In the below-given image, you can see that the United States was ranked at the top in the list of beauty and cosmetics deals, whereas India stood for the second. Now, let us dwell some the current top beauty tech startups that are performing well in the market. Glossier is one of the hottest cosmetic startups, which has raised $52 million in Series C round of funding. 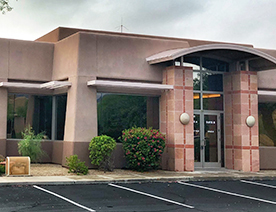 It is just 3-year-old cosmetic startup and the total valuation of the startup was $400 million in March 2018. According to the SimilarWeb report, “The average monthly visits in Q4 2017 were three times higher than the same quarter in 2015”. 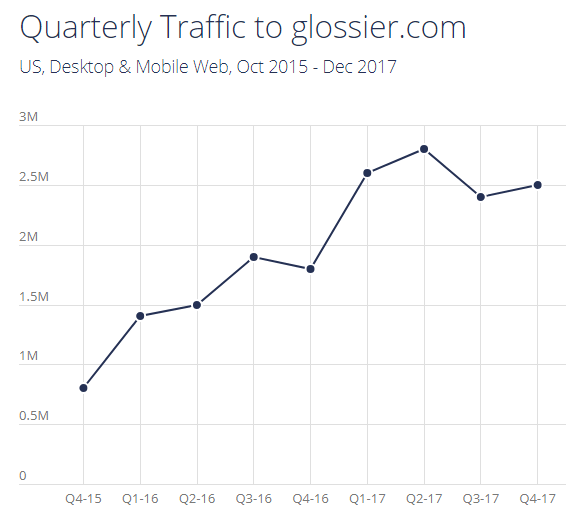 The below-given graph embraces Glossier’s total traffic. On the other hand, The Ordinary is the Toronto-based company, which is responsible for a breakout in the skincare line. The startup has attracted funding from the cosmetic giant Estée Lauder. “The multi-category cosmetics and skin line are the coolest and interesting categories right now”, according to Ross Blankenship (a venture capitalist at Angel Kings). 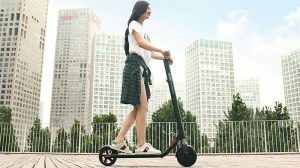 Also, the profit margins of beauty and cosmetics are so high, especially compared to perishables, which attracts investors to these fresh startups long-term. This is an online marketplace, which connects beauty and wellness professionals with clients. The company has found similar success. 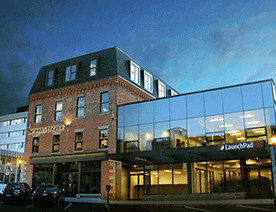 The company provides a platform that caters to beauty professionals’ requirements. Styleseat helps consumers to find a customized service like booking for a stylist for a certain type of braid. With the total funding amount $40 million, the on-demand beauty services are provided in 15,000 cities since its launch in 2011. Moreover, cosmetics and grooming are the two main categories that beauty startups can consider to develop an app to go to the next level. After diving into the shape of the beauty tech market and top beauty tech startups, we’ve come up with the following reasons that tell you why it is pivotal to create a mobile app for beauty salon startup. The are several major beauty brands that are investing in augmented reality to enhance the experience of their customers. The technology-backed cosmetics brands have transformed the industry. As beauty tech industry fueled its growth, it has become more personal and accessible for all. And, most of the consumers prefer purchasing cosmetic products online. It is no secret that today’s consumers increasingly seek transparency when it comes to the beauty products. Beautylish apps are meant for solving shoppers’ needs. One of the main reasons to develop is to allow your app users to browse different beauty products from the comfort of their home. Users now have a lot of options to shop in beauty. The mobile app also helps shoppers to replicate the experience of trying cosmetics products and use data from smart devices to create personalized makeup apps for customers. 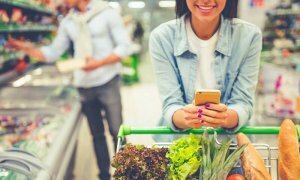 Specifically, the younger generations do not prefer to go to physical stores, and they usually prefer the mobile app for shopping on-the-go. As the beauty industry has transformed with the emergence of technology, a lot of people have the highest expectations. Therefore, if you are running any beauty startup, then you need to think to develop an app to take your beauty brand to the next level. 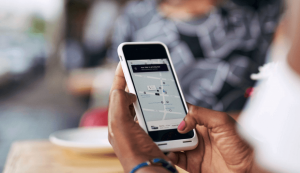 Undoubtedly, the on-demand solutions mean convenience. The Global Cosmetic Packaging industry market was worth $24.3 billion in 2014, and it is estimated to reach $31.4 billion by 2020 with an annual growth rate of 4.3%. This data simply means that in future, the industry will expand and offer more solutions to consumers. Talking about the on-demand beauty service solution in terms of the app, convenience plays an important role that leads to enhancing customers’ experience through the app. The beauty booking platform helps beauty and wellness professionals to connect with the app users and has found similar success. Online booking beauty platform helps consumers to find a customized beauty service, including to discover top barbers & professionals nearby, automatic appointment reminders, book online according to their preferences, and online payments. All these features provide convenience to users. That’s why technology has transformed beauty industry by providing services in terms of handy features. 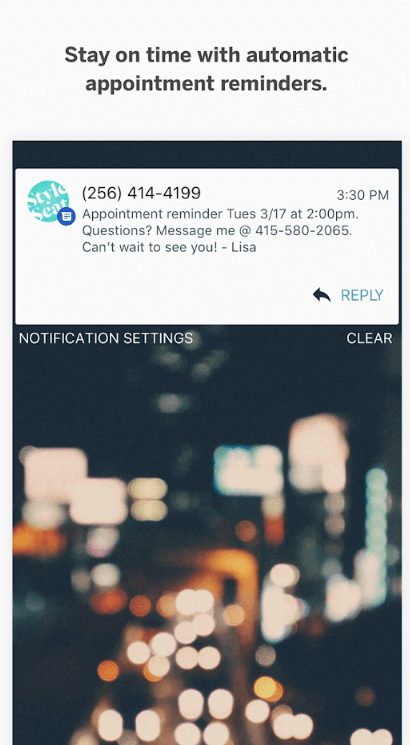 In this way, by booking a beauty appointment is no longer a hassle for users. Also, attract more customers to your business by providing an easy-to-use app. It is important to enhance consumers’ in-store experience through the creation of customized and personalized beauty products. It is expected to be firstly implemented in color cosmetics through personalized shades. Let’s take an example of Matchco, a San Francisco-based startup. 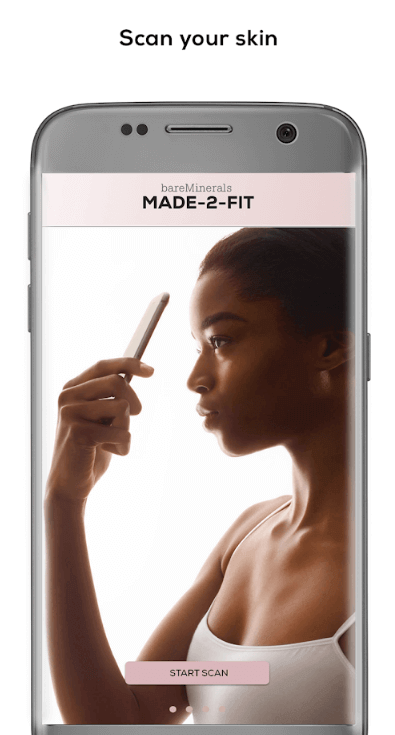 It allows app users to scan their face to create a custom foundation for their exact skin shade. However, Matcho company was acquired by Tokyo-based Shiseido later for an undisclosed sum. So, customization is one of the main reasons why beauty tech startups need to have mobile beauty apps to give personalized service to their customers. That’s being said that everyone looks for personalized solutions, especially when it is online. No matter in which industry you are dealing with, a mobile app has now become a persona of business. So, the tech beauty brands are successful because of providing a perfect blend of solutions, including customization, convenience, and options to browse beauty products to consumers on-the-go. However, you as a beauty tech startup need to be unique when it comes to building an app for the same before Amazon takes over these booming categories. In case, if you have any query or confusion regarding beauty salon mobile app development, then you can directly contact us as we are a leading iOS/Android application development company, and have already developed over 3000 mobile apps under diverse categories. All you just need to fill up the below-given form and our sales representative will get back to you within 48 hours. This page was last edited on February 4th, 2019, at 8:09.